While her mom’s away Baby Hazel will engage in play, and certainly not the kind her mom would approve of! Baby Hazel does a great job fooling her mom into believing she’s asleep. When mom puts her down and heads out for a bit of shopping, this sweet little girl shows us her mischievous side. All alone at home, let the shenanigans begin! What a great place for a baby to wreak havoc! In the drawing room you will help precious Hazel go through some drawers, write on the wall, make paper airplanes and more. When she grows tired of playing alone, this little angel calls her friend Mia to come join in the fun. These two cuties enjoy turning on the music and making big messes together. Eventually, the two friends grow hungry and head to the kitchen to eat. Can they get through their meal without making more mischief? Feed them burgers and fries and get them each a drink. A bit of clean up will be in store as these girls simply can’t avoid making messes all over themselves and each other! Uh Oh! Mommy’s On Her Way Home! Baby Hazel realizes her mom will be home soon so the two girls get busy cleaning up. Will that drawing on the wall wipe off with ease? Will they be able to get things back in shape and Hazel back into her crib before her mom walks in the door? Play this fun, interactive game to find out! 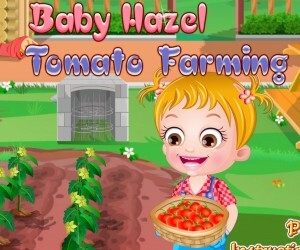 This fun game will help young children build fine motor skills through use of the mouse to play. It will also help strengthen hand-eye coordination. Younger children will need help clicking on items and dragging them where they need to go, so this game provides great opportunity for quality parent-child time. This game also teaches children if they make a mess, they should be sure to clean it up!